People who love fish have many more health reasons to eat them, while those who do not add fresh fish into a daily diet regime should perhaps read on to get that extra motivation. Eating just a portion of fresh fish once a week (around 85 grams) may decrease your chances of having a heart attack. Here’s what you need to know about the goodness of fresh fish and how it supports healthy heart and brain function & improves the condition of your skin and hair. A recent study showed that women who ate very little or no fish at all increase their chances of heart problems by 50%. The less people consumed fish, the higher their risk for developing heart related illnesses. Fish is good for the heart because it contains omega-3 fatty acids – also called omega-3s. Humans cannot naturally make omega-3s yet they’re essential to our good health. Fish oil that’s rich in this nutrient can decrease overall body fat levels and support a stronger heart. Eating fish once a week helps you to preserve neurons which are important to memory and cognition. 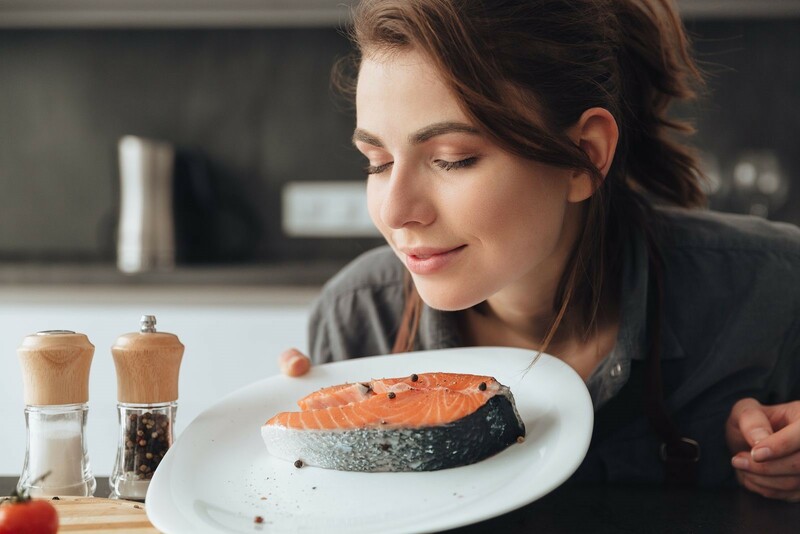 According to studies mentioned in EverydayHealth.com, people who eat fresh, baked or broiled fish regularly tend to have a bigger brain mass and are able to better sustain areas of the brain that are responsible for maintaining memory and learning function than those who don’t eat fish at all, Sufficient brain mass and active neurons can stave off cognitive decline including Alzheimer’s disease. A diet rich in fish is also beneficial to your skin and hair. Omega-3s nourish the skin and make hair shiny as they nurture hair follicles. Furthermore, DHA and EPA in fish may resolve problems of dry brittle hair and itchy scalp through improving hair strength and blood circulation. Eating fish regularly may also contribute to the treatment of skin conditions like psoriasis. Other studies noted that apart from antidepressant medicine, omega-3s in fish can help manage and lower depression too. It is possible that the effect of natural fish oil on the brain can have protective effects from anxiety and other conditions connected to being in a depressed state. The omega-3 in Salmon and nutrient-rich fresh fish are vital for growing children because they support brain development. Eating fresh fish or cooking it from scratch offers essential nutrients for the young brains of your kids. You now have five reasons to buy fresh fish and eat it at least once a week. Consuming fish regularly is much better though as this nutrient-dense food is good for your heart and brain and is well documented as beneficial for healthy skin and hair. Get your fish fresh from the market and add it to your family’s diet for a healthier, more fulfilling life.